Dear Readers, is there any plant more ubiquitous or more recognisable at this time of year than the daffodil? I spotted this fine collection of yellow trumpets outside the flats on the corner of Church Lane in East Finchley, and, with their ‘heads’ all pointing in the same direction they remind me of nothing so much as a flock of flamingos during their mating ritual. The problem with daffodils is that, although they are native plants, and do still grow in the wild (although to nothing like the extent that they used to, as we shall see) they are also planted just about everywhere. And I can see why. They are so emblematic of spring, so cheerful in their yellow finery and such a relief as the winter days start to lengthen that they bring a smile to the most miserable of faces. So, what does a truly wild daffodil look like? The truly wild daffodil (Narcissus pseudonarcissus pseudonarcissus) has a single flower on every stem, creamy white petals and a darker yellow trumpet. Where it likes the habitat, it can be very prolific – think of Wordsworth’s ‘host of golden daffodils’. An area around the Gloucestershire-Herefordshire border used to be called ‘The Golden Triangle’ and in the 1930’s the Great Western Railway ran ‘Daffodil Specials’ from London, so that people could walk among the flowers and buy bunches to take home. The daffodils were an invaluable source of early spring income for those who farmed the land on which they grew, and for the casual labourers that were employed to pick them. These days, wild daffodils seem to occur in very discrete areas – as Richard Mabey points out in Flora Britannica, they can be found in parts of south Devon, pockets of the Black Mountains in Wales, the Sussex Weald, Farndale in Yorkshire and the Lake District (for a list of wild daffodil sites, have a look at the Wildlife Trust list here.) But there seems to be little rhyme or reason to the distribution of the populations – daffodils are not fussy with regard to habitat (as anyone who has grown them can attest) and perfect habitat is sometimes shunned. 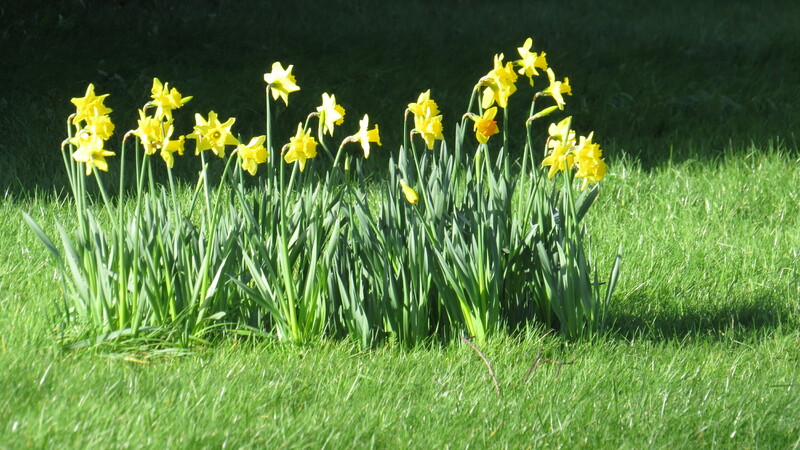 Could it be that the popularity of the daffodil as a plant for cutting has led to it being artificially spread to some areas and not to others? I suspect we shall never know. Daffodils are also known as Lenten Lilies, as they start to appear roughly when Lent occurs – this year it starts on February 10th, so the plants here are a little early. 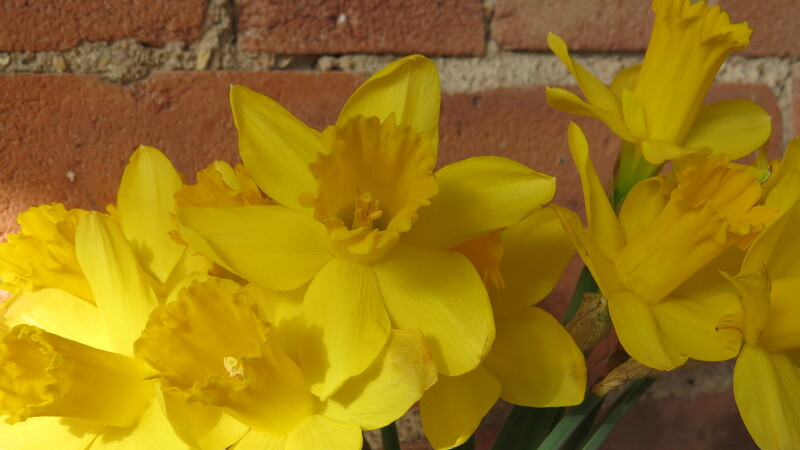 However, although for us they are such symbols of spring, it was also believed in some parts of England that bringing daffodils indoors was unlucky (probably because to some eyes, the plants appear to be hanging their heads in shame). In particular, no chicks or ducklings would survive on a farmstead where the daffodils were brought inside the house, maybe because of the sense of a link between the golden colour of the flowers and the yellow fuzz of the baby birds. 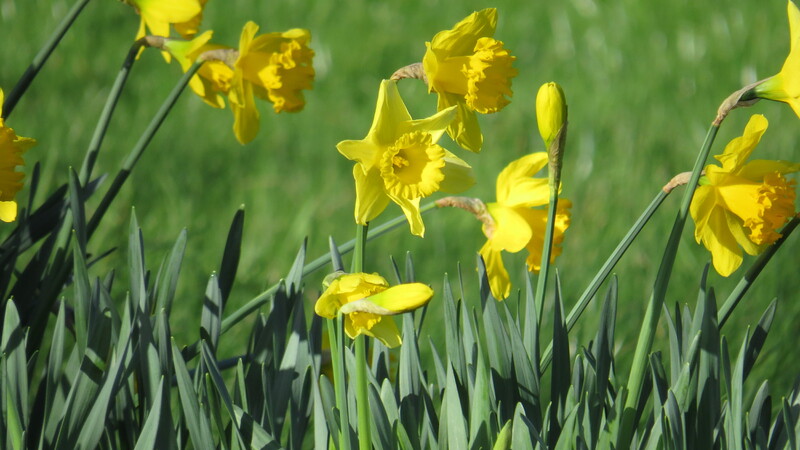 In Wales, however, where the daffodil is the national flower, the first person to spot a plant in bloom would be set to receive more gold than silver during the coming year. 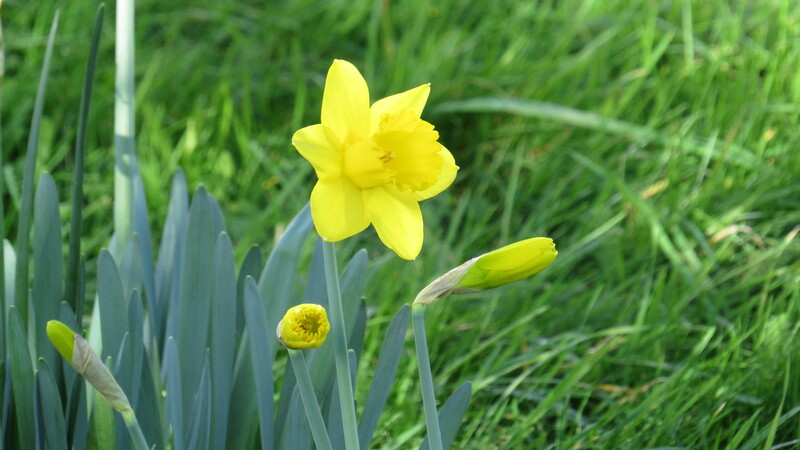 Other folklore included the belief that pointing at a daffodil would prevent it from coming into bloom. To dream of a daffodil is said to indicate that love and happiness is on the way. It is clear that daffodils have a somewhat mixed folkloric reputation, though they are currently being rehabilitated through their association with the Marie Curie Cancer Care Trust – many of us have had reason to be thankful to the carers and nurses of the organisation, who help to support those with cancer and their families. In this context the daffodil is a symbol of hope and kindness. However, daffodils were said to be the plants that Persephone was gathering when she was snatched by the lord of the underworld, and they were also said to grow in Hades, on the banks of the river Styx. In many cultures they have been grave flowers, so there is no escaping their association with death and loss. Well, one of the joys of writing this blog is all the things that I find out as I research my pieces. I will make certain to keep the daffodil bulbs and the onions separate, and I heartily advise you to do the same. Incidentally, the leaves are also poisonous, and there was an incident in Bristol in 2012 when a Chinese supermarket was stocking bunches of daffodils in bud, and the shoppers were mistaking the plants for Chinese Chives. Around ten people were treated in hospital. Clearly, narcissi are not plants to be messed with. Just because a plant is poisonous, however, does not mean that it doesn’t have medicinal uses. 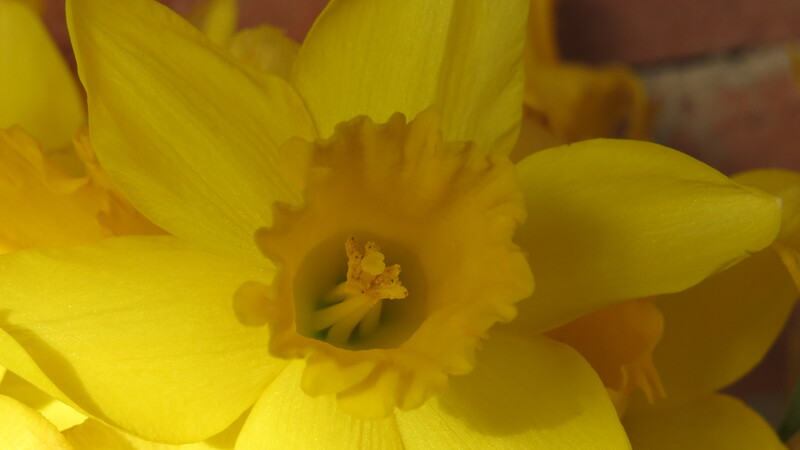 One of the alkaloids in daffodils, galantamine (also present in snowdrops) is currently being researched as an early stage treatment for Alzeheimer’s Disease. 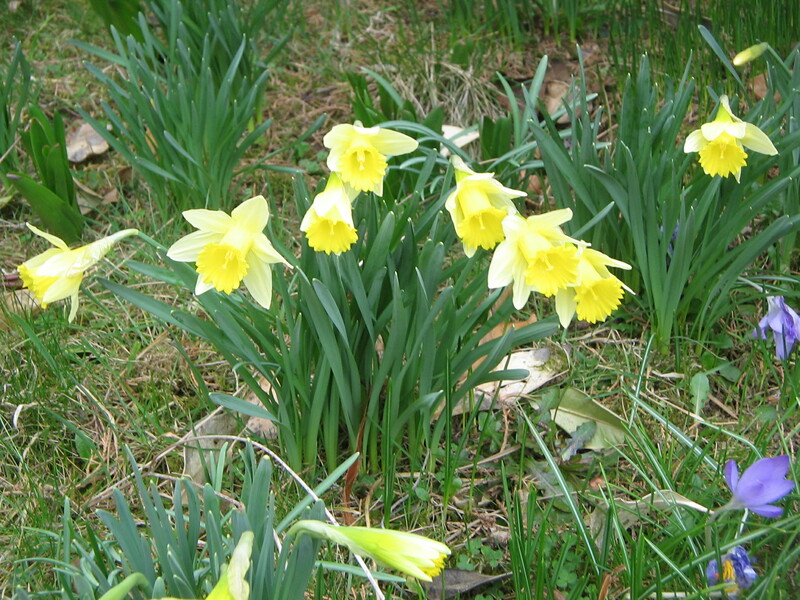 It has been found that galantamine is present in much higher concentrations when the plant is grown at altitude, and so 120 acres of daffodils have been planted in the Black Mountains in Wales to see if it is possible to harvest the chemical in an economic way (ten tons of daffodil bulbs are required to produce one kilogram of galantamine). At £600 per ton, this could be a useful source of income for beleaguered Welsh hill farmers, whilst at the same time providing help for the sufferers of this infernal disease. Let’s hope so. For further details, have a look on the Joint Nature Conservation Council website here. Daffodils are probably too common to be truly appreciated – there is none of the sense of awe that stumbling across a bluebell wood or a bank of snowdrops has. And yet, it has not always been so. Have a look at the painting by Vincent van Gogh, below. It has a hallucinatory quality, that sense of walking through a world transformed by abundant and unexpected beauty. There is something precious about the butter-yellow of a daffodil emerging from its papery shroud and turning its face to the sun. Like all common things, it is worthy of a little more attention than we usually bestow upon it. This entry was posted in London Plants on February 3, 2016 by Bug Woman. What a great post. 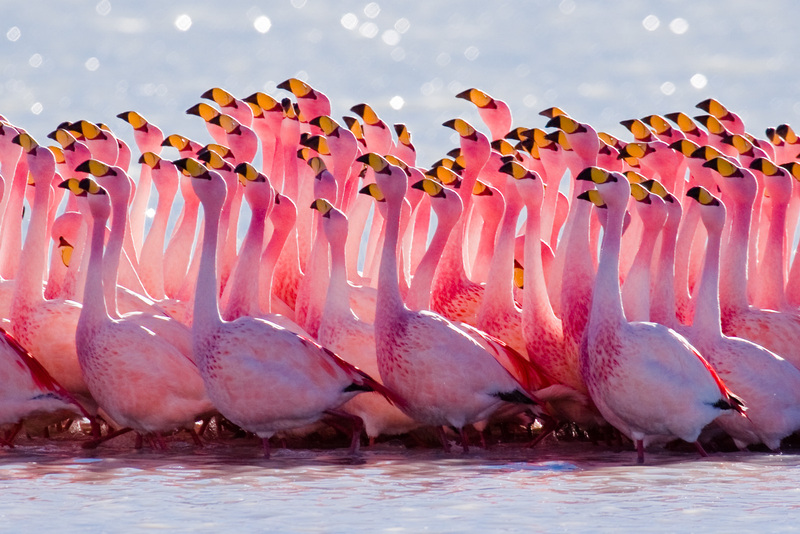 These are spectacular flowers we don’t get here. As usual, humans who mess with nature may be responsible for their decline in some areas, this means taking parent plants from the wild to cultivate them in nurseries. Plants which have a lot of inbreeding are prone to diseases and start producing weak cultivars, so they lose the vigor they had in the wild. Very interesting, Maria – I’ve been following your posts on Chrysanthemums with interest. It’s true, there are hundreds of cultivars of daffodils developed from the parent stock here – it seems that we’re not happy until we’ve made something double-flowered and multi-coloured :-). I have a book from 1912 which describes the wild daffodil as the ‘Common Daffodil’. A hundred years later, and it’s not common any more…. Yes, I’ve been covering mums here to show off their beauty, but I don’t necessarily agree with all the cultivars created by humans or the flower trade. I just find it interesting to look at it and understand its history. I know England has many wild native mums (naturalized, because they came from China), and also spectacular cultivars originating from England exclusively. So, I just find them interesting to learn about. Like bluebells, daffodils are best in their uncultivated form for that ‘wow’ factor when you come across them in the wild. Unfortunately, that doesn’t happen very often here because people tend to pick anything they come across – and the biggest catch (and the most lucrative) is wild lily-of-the-valley to celebrate the first of May. Chrysanthemums are used to mark the Toussaint (All Souls’ Day) and despite their beauty, symbolize death for many French people. I just think they’re incredible flowers – and I make the most of the occasion to admire their beautiful feather-like petals in the garden centres before the plants make a one-way trip to the cemeteries to decorate tomb stones. That’s so interesting, Beach-Combing Magpie – here, chrysanthemums are often seen as the kind of flowers that errant husbands buy from the garage when they realise that they’ve forgotten Valentine’s Day on their journey home from work. They are extraordinary flowers though, I know what you mean about the feather-like petals. My dad used to have a soft spot for dahlias, which can be equally beautiful, I think. Only just got round to reading this and it is blowing a gale outside and rain hammering at the windows this post is full of cheery yellow images….ideal!! Fascinating folklore facts and sagely advice too! I noticed some miniature daffs had come out today in the garden and I really like the ones with swept back petals…they remind me of Piglets ears! !